The PUC vibroreactor is especially well-suited for the production of emulsions and dispersions. It is used in the foodstuffs, pharmaceutical, chemical and petrochemical, and cosmetics industries for the wetting, comminution, mixing, de-agglomeration and homogenizing of liquid/solid mixtures. The rotor-stator system has a three-stage configuration and is equipped with an axial rotor. It is ideally adapted to the homogenizing process. The machine also allows defibration and can therefore be used in a wide variety of applications. The high degree of turbulence in the rotor-stator system reliably achieves extremely small droplet sizes and thorough distribution. In many applications, the vibroreactor can replace high-pressure homogenizing as droplet sizes below 5 µm, which are adequate for many process applications, can be achieved. Frequently, the machine is connected to batch hoppers, mixing and agitator vessels to reduce mixing times or accelerate dissolving processes. These machines can process any material that can be pumped. PUC type EL colloid mills are designed for in-line operation. 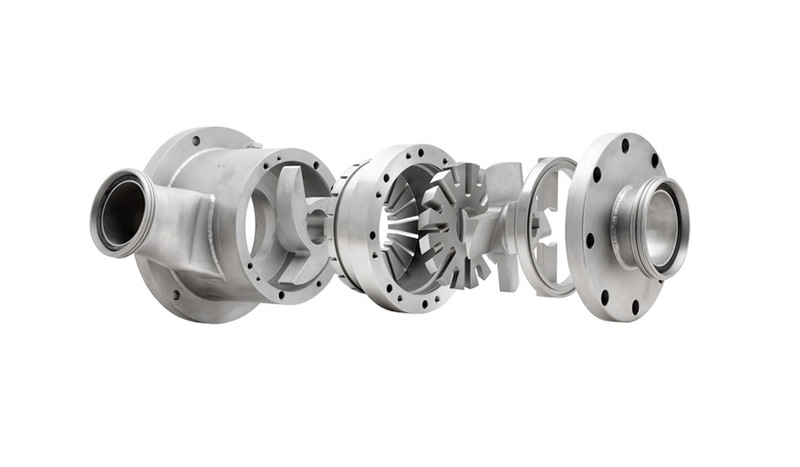 They can be supplied with many popular types of connection (threaded nozzle, flange, tri-clamp, etc.). A special feature of type EL is the bearing block that allows our customers to use their own standard motors (standard B3 motors). At high inlet pressures and viscosity values, the forces generated can be absorbed even more effectively by the separate bearing. Our bearing blocks are fitted only with high-quality bearings with permanent lubrication, made in Germany. Frequently, these machines are integrated in in-line operation to reduce mixing times or accelerate dissolving processes. Type EL vibroreactors are available in standard sizes with capacities between 150 and 100,000 l/h depending on the viscosity of the product. The vibroreactors are supplied with standard stator-rotor combinations. Bespoke solutions are also available for special applications. All units are available with various single and double-acting mechanical seals and with lip seals (PTFE) in accordance with FDA requirements. The seal is integrated in a seal mount which is identical for all types and sizes of vibroreactors. This facilitates the installation of the seal and later replacement with a different seal system, if necessary. *The values given above are purely indicative; the actual values depend on the material processed. Our technical department will design the optimum mill for your application. A selection of industries which use type EL vibroreactors and the products typically handled are listed in the table below. If you cannot find your application in the table, just contact us. Without any obligation, we will provide advice on the optimum machine for processing your product.